Located on the very northern portion of the Markham Woods Luxury Corridor, River Crest is an established community on the banks of the Wekiva River. The community is gated and guarded and features river dock facilities. There are a few homes on the river and each home is custom built on lots starting at one acre. 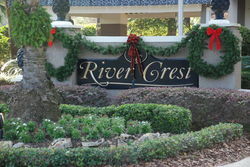 If you would like to tour River Crest or any other community Contact Us.